Experience this beautiful winter setting during the holidays! Built in 1917 for use with draft horses, the Big Yellow Barn is a local landmark. 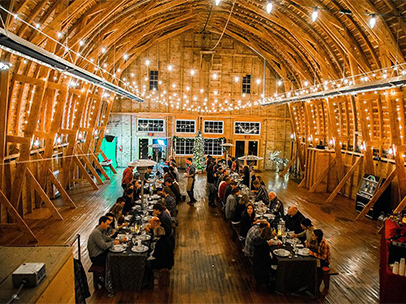 While still sticking close to its agricultural roots, the barn has been renovated to be the perfect venue for your private holiday party. The main indoor meeting area is the second floor of the barn, which can comfortably seat over two hundred guests for a formal dinner. Our catering policy is flexible and designed to accommodate your preferences. If you have a caterer you would like to work with—you are welcome to. If you would like us to handle the catering—we are happy to. With dinner options ranging from a gourmet soup buffet to an indulgent plated dinner, and bar service available—we will work with you to craft your ideal holiday gathering. to schedule a showing and discuss rates and availability.